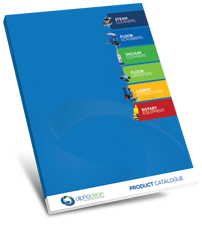 You are here: Home / News & Updates / Alphaclean / Which floor scrubber should you choose? Having the right tools for the job can make all the difference in terms of your efficiency and productivity. In addition, it’s important to keep up with technology and the changes in equipment so that you’re prepared when it’s time to upgrade or replace your current cleaning equipment. Ride-On Scrubbers – Ride-on scrubbers are great for businesses or sites that need to clean large areas including factories, shopping centres, large public areas, convention centres. They can clean large areas quickly and efficiently, reducing, and even eliminating worker’s physical stress and fatigue caused by floor cleaning. These are not ideal for cleaning small & narrow spaces unless the ride on scrubber has good turning circle capability with easy vision. Walk-Behind Scrubbers – These are great for cleaning hard-to-reach spaces and narrow aisles. Walk-behind scrubbers often come with a range of brushes and pads giving the user a great deal of utilisation. These machines can be stored in small cleaner’s room. In addition, they are generally quiet when in use and are informally friendly. Multi compact Scrubbers – These are generally small enough to fit in a cupboard or boot of a car and can be removed easily to clean an area on a daily or bi-daily basis. These areas can include, restaurants, kitchens, small rooms, pubs, clubs and entrance foyers. Rotary Scrubbers – Rotary scrubbers are multi-taskers in that they strip, scrub, and polish all in one process. Depending on the type, they are either swing or straight line machines. These scrubbers differ from the others where they do not have the capacity to collect any waste water. They can maneuverer into hard to reach areas and can be used on a wide variety of surfaces, like concrete, marble, and vinyl. Look at your company’s needs and see how they match up with the offerings of each kind of scrubber. This way you can get a good feel for what kind of cleaning machine will be the best fit for your business. Floor scrubbers are generally powered by batteries or electricity. A floor scrubbing company can further assist you in making a solid choice that will save your business money and increase your productivity.